VETERANS MIDDLE SCHOOL – Veterans Middle School is proud to announce that one of its own students, Andres Salazar, has won the Patriot’s Pen Essay Contest at the local and district levels! The Patriot’s Pen Essay Contest is sponsored by the Veterans of Foreign Wars and it gives middle school students the opportunity to write essays expressing their views on democracy while keeping within the patriotic theme. This year’s theme was “When is the Right Time to Honor Our Military Heroes?”. In the local contest, Andres competed against the three middle schools within the Rio Grande City Consolidated Independent School District . At the district level, Andres competed against schools from twenty-two different VFW posts that ranged from Laredo to Brownsville and Hebbronville to Raymondville. 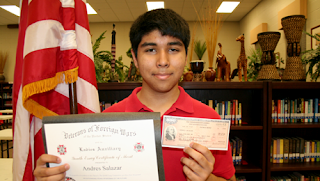 As part of his recognition for winning the contest at the two levels, Andres was awarded two US Savings Bonds in the amounts of $250 and $500, respectively. VMS congratulates Andres and his parents, Pedro and Rosa Salazar. RGCCISD photo.